Similar to the years before, U.S. company AbbVie’s Humira maintained its place as the global top ranked drug based on revenue. During 2018, Humira generated a huge 20 billion U.S. dollars in revenue, another significant increase from 18.4 billion dollars the year before. The second ranked drug Eliquis, marketed by Bristol-Myers Squibb and Pfizer, made less than half of Humira’s revenue. Celgene’s Revlimid completed the top ranked three pharmaceutical products worldwide. Humira is used mostly for the treatment of rheumatoid and psoriatic arthritis. However, like many other top drugs, the range of medical conditions it can be used to treat is much larger. Thus, the drug is also used to treat Crohn’s disease, ankylosing spondylitis, ulcerative colitis, psoriasis, uveitis, and some other autoimmune diseases. Humira is administered subcutaneously via injection. It was approved for the first time in 2002 in the United States. Blockbuster drugs often have a large impact on the manufacturer. In some cases, pharmaceutical companies are highly dependent on their sales performance. In the case of Humira, AbbVie generates over 60 percent of its total revenue from this drug and almost 80 percent from its top 3 products. Companies that depend on a small number of blockbuster drugs could be under threat of heavy revenue loss. Biosimilars of Humira (adalimumab) are already available and will take more and more of the market in the years to come. Thus, it is not expected that Humira will exceed the 20 billion-dollar-revenue mark but will more likely suffer from a distinct revenue decrease until 2024. * Pfizer figures for Eliquis consist of “alliance revenues” reflecting products co-developed with partner companies, as well as direct sales in some regions of the world. ** Pfizer markets Enbrel outside the U.S. and Canada, where the treatment is marketed by Amgen. *** Biogen receives a share of U.S. pre-tax profits on sales of Rituxan, which is marketed by Genentech (Roche). Sales figures do not include U.S. pre-tax profits generated by Biogen, since the company only discloses those profits combined with profits from Gazyva® (obinutuzumab), and does not break out each product separately. Biogen reported combined Rituxan-Gazyva pre-tax profits of $1.432 billion for 2018, and $1.316 billion for 2017. **** Pfizer lists separately the Lyrica revenues generated in all of Europe, Russia, Turkey, Israel, and Central Asia countries ($347 million in 2018, $553 million in 2017). 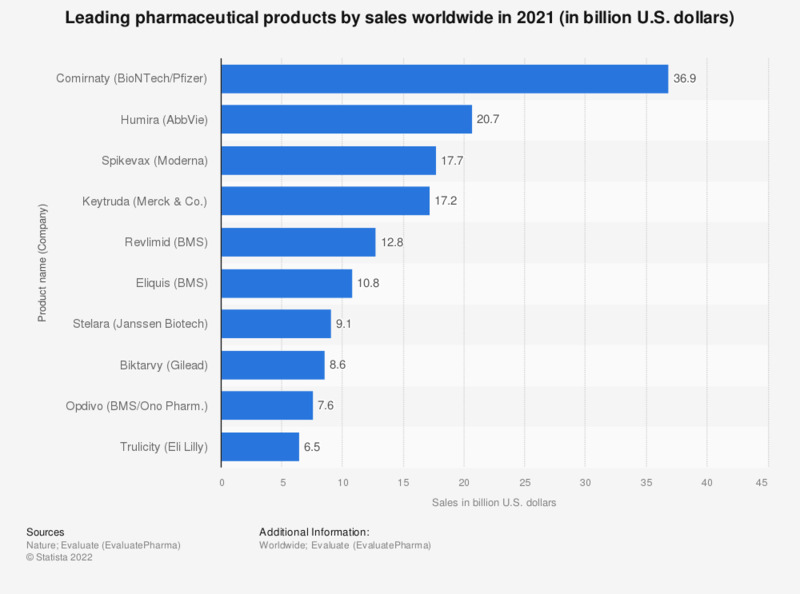 Those revenues are listed by Pfizer’s “Essential Health” operating segment, while its “Innovative Health” segment records Lyrica revenues generated elsewhere in the world, including the U.S. ($4.622 billion in 2018, $4.511 billion in 2017).